A coalition of more than twenty faith and community groups, Justice, Safety, and Jobs, protested October 16th at City Hall for police accountability. Years before Freddie Gray’s death while in police custody, unarmed Tyrone West was healthy one minute, dead the next – after his encounter with Baltimore Police one summer evening in 2013. Police and witnesses say anywhere from 8 to fifteen officers fought West to the ground during a traffic stop in Northeast Baltimore. Recently, at Greenmount Ave. and 33rd St. (the location changes every week), an Australian media outlet was filming “West Wednesdays,” as they’re called. Jones has garnered much attention for her activism, which is focused on police reform. West’s death was investigated internally by the Baltimore Police. The officers were never prosecuted. 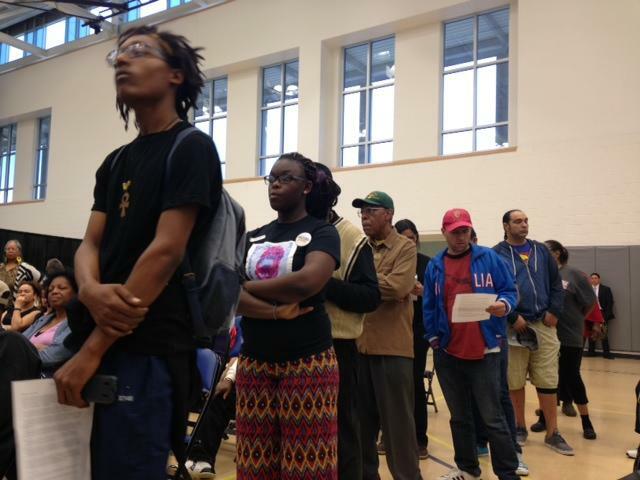 West Wednesdays have become a centerpiece of the “Black Lives Matter” movement in Baltimore. Jones holds up posters with some of the accused officers’ names. One night, a passerby stopped after he read the sign. He told her the same officer had assaulted him just weeks before her brother’s death. “These are repeat offenders,” Jones says. “We are not anti-police, because we know that we need good police. But until [city officials, BPD, State’s Attorney] hold [police] accountable, the trust is gone." The pressure on police is coming from all directions. Ben Jealous, former Executive Director for the NAACP, recently stood with more than 20 community and faith groups calling for City Hall and the Police Department to do the same thing. “Do your job. When there’s an officer who have broken the public trust because they are corrupt or violent in ways that are completely unnecessary – get rid of them,” Jealous said. As The Baltimore Sun reported last fall, victims of alleged police abuse who file suit, do get some results. City taxpayers paid approximately 6 million dollars in police brutality cases from 2011 to 2014, according to their investigative reports. Earlier this year, the ACLU released a report on the number of people who died after encounters with Baltimore police: At least 31 between 2010 and 2014. The ACLU compiled information from FBI data and online news sources. Baltimore Police won’t release information about their officers’ misconduct. Questions like: How many complaints were filed against city cops in the last year? How many times were disciplinary actions taken? And what kinds of penalties were handed out? That information, they say, is “not open to the public”. How many police brutality investigations were ordered last year in BPD? Attorneys for those plaintiffs who take their cases to court say even they have an almost impossible time trying to get that information. This lack of transparency is a huge stumbling block in the quest for building community trust. How can the community trust an officer when the department is closed? Major Steve Ward has been working in Baltimore’s Eastern District for ten years, commander since January, on the force since 1999. He says he and other officers know there are problems in the BPD. “We need to make sure that our supervisors – when they get complaints that they don’t blow it off and there really is an investigation. If it’s a use of force complaint, they should do an area canvas. Then they will talk to the individual who was arrested and the person who made the complaint." Police supervisors are supposed to write that information down in a report. Ward says, because almost everything hinges on the internal police investigations. After the investigation, he says, there are several ways things could go for the officer: will he or she get a talking to? Will the officer get suspended? Fired? Will they face criminal charges? But since the police are investigating themselves, the community is more than a little skeptical. Ward says after the unrest in April, he went on a listening tour. He walked and walked the streets of his Eastern district - handing out his cell phone number. The calls started coming in – some from people he’d never met. Eventually, he started putting together his district’s post-unrest action plan. Since the unrest, he’s organized Friday night movies in his Eastern district. His officers set up the movie screen then they grill hot dogs and hamburgers, and pop the popcorn. Other officers serve the crowd - putting straws in juiceboxes and dishing out the food. Major Ward talks to parents about how they’ve been scared to approach officers, how they warn their children to walk on the opposite side of the street as an officer. He carries pre-schoolers in his arms and jokes around with older kids. Besides Friday night movies, he’s done police-community pizza nights, summer block parties, and neighborhood walks. He’s planned an upcoming coat drive – and an Eastern District Thanksgiving dinner. Ward says when he started on the force in 1999, this was the kind of policing he wanted to do, but he never had the backing of the force. They were focused on the “broken windows” theory and “chasing the numbers” – arresting for every misdemeanor crime they could find: loitering, selling loose cigarettes, disorderly conduct. These events won’t change the department’s accountability or transparency but, he says, they put officers on the streets they’re supposed to know and understand. But will those officers adopt Ward’s style and “guardian” mentality? Jones, like Major Ward, says she’s not going anywhere until she sees action on the part of the police department. On The Watch is supported by grant funding from the Bendit Family Foundation, Sig and Barbara Shapiro, The Zanvyl and Isabelle Krieger Fund, and The Open Society Institute-Baltimore. Hundreds of local residents were at Coppin State University last night for a town hall meeting about police reform hosted by The U.S. Department of Justice.